There is an almost inordinate amount of controversy over Vampire Weekend, a band that deserves zero controversy whatsoever. My theory is that they embody the spirit of current “indie rock” so well that it hit a little too close to home when everybody realized they like them. I hate the word “indie.” It is useless and tells me nothing. And yet people seem to think “indie” is a genre of music, when really what they are referring to is more of a process. Recipe for success in the independent music industry: put two cool sounding words together for your band name, dress up in ways that no one else does (ironically, not too many other people in the industry, if any, wear polo shirts), record your album in your garage, throw in some stylistic eccentricities (yeah, they listened to a couple afro-pop records, but really it’s just cheap advertisement), and watch the cash roll in as you get discovered. I think the fact that Vampire Weekend did all of these things and succeeded with flying colors was what erked the hipsters – it’s so hip that it’s unhip. Then they got blasted for not being dangerous enough – “Innocu-rock” as Gym Class Heroes frontman Travis McCoy calls them. And yet VW frontman Ezra Koenig rocked out onstage with Fucked Up, one of the most dangerous bands in the business, during their now legendary twelve hour show at the Rogan Store in New York City. Through all this meticulous dissection and criticism, they seem to smile through it and have a great time. In their live shows, their easygoing nature is contagious. And yet the only reason they have garnered so much attention in the first place is because they made a chamber pop album that really works and that everyone seems to enjoy. The thing seems to be injected with morphine; whatever whatever pains or anxieties that might be lyrically present are glossed over by cheap, catchy melodies. And it may be a cheap, catchy melodicism, but it’s intelligent and consistent, without a bad song (yes, even the somewhat debated Blakes Got A New Face, which I, for one, love). I didn’t even know what a Mansard Roof was until I started working at a roofing company office over the Summer (where I listened to this album all the time), and I’ll bet most listeners initially scratched their heads at the punctuation jokes Oxford Comma. You don’t have to be Columbia educated to appreciate this one, though. It’s loaded with memorable Mothersbaugh-esque pop music made by people who probably weren’t planning on selling lots of records despite the fact that they did, and it makes all the controversy that much funnier. The truth is that the “indie culture” is afraid of these guys and finds them completely dangerous because they made a great pop album while being themselves. The impressive thing about new band Vampire Weekend’s debut album is not its consistency or eclectic flavor, but instead its immediacy. Instead of any attitude that this weekend will be a weekend that we will remember for the rest of our lives, or that we will get smashed and do things that can’t be erased, this weekend resonates of a straightforward, fun, in the moment attitude. It has been a long time since I have heard an album this shamelessly happy, and a long time since that kind of happiness has not been distracting or aggravating. Part of this might be due to the simple, warm instrumentation. The drums are propelling yet anything but tough. The guitars almost sound hushed. And everything else seems to be produced to be comfortable. That isn’t to say that the album is boring, however. Although the aim might be comfort and happiness, the sheer consistency of the album keeps it unique and compelling. To say that the band are smart would be an understatement. This kind of utilization of stringed instruments suggests classical training, and anyone who even knows what an Oxford Comma is can’t be a chump. 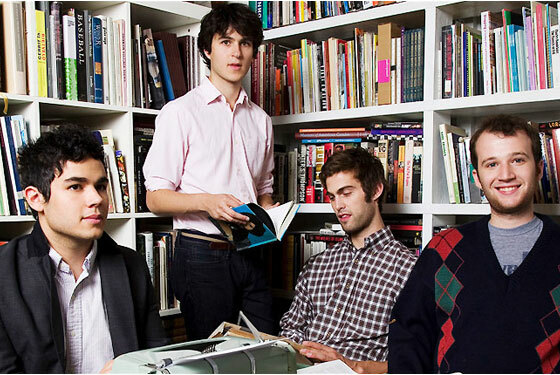 Vampire Weekend seem to have discovered the alchemy to make pop gold. Arpeggiations dot songs beautifully throughout, most notably on the string laden M79, which makes use of hooks from a guitar, string section, and harpsichord (or at least the harpsichord setting of someone’s keyboard). This song is not lonely in its appeal. In fact, even a new listener could go through the album and never have any even remote desire to switch songs. The fact that they hold attention while flipping through an ocean of variety is that much more pleasing and impressive. From loud Little Richard esque piano pop (Walcott), to African rhythms over simple chord progressions and pleasing switchups (Cape Cod Kwassa), to glowing Mark Mothersbaugh esque chamber pop (Campus), and to giddy electro fun (Blake’s Got a New Face), there is not a corner of this album that feels unnecessary or able to be improved upon. This album gets the highest regards for the simple fact that every song is great, and it will appeal to people who listened to The Beatles in high school as well as people who remember the Rugrats theme song fondly.